Port of Earth is one of my favorite science fiction comics of the year. 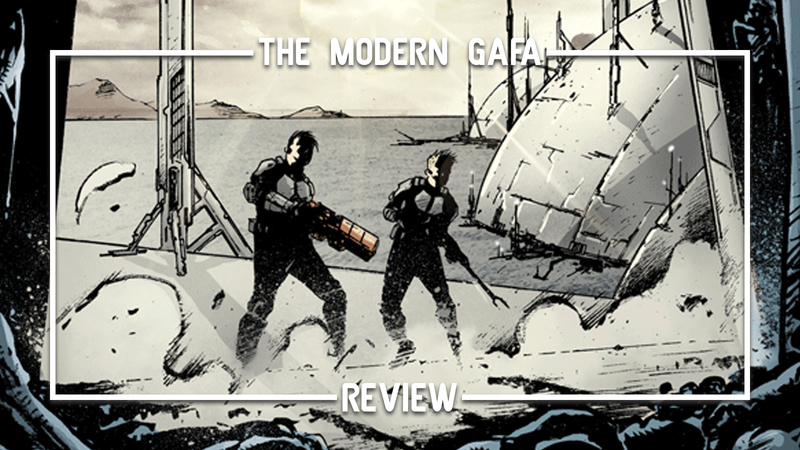 It’s got perfect amount of political intrigue balanced with alien action. The first volume introduced us to our characters and the Port of Earth itself. This volume the conflict continues inside the Port itself. Check out my full review of Vol. 2 after the jump. Disclaimer: Disclaimer: I received advance copies of the individual issues collected in Port of Earth Vol. 2 courtesy of Image Comics. The Port of Earth is open for business to all galactic alien travelers, but as our alien business partners secretly visit Earth, an unresolved alien threat emerges, and recently traumatized Earth Security Agents Rice and McIntyre must balance between protecting humans and alien visitors alike, while shouldering the fate of Earth’s autonomy of our own planet’s security. A politically-charged, thought-provoking sci-fi action thriller from ZACK KAPLAN (ECLIPSE) and ANDREA MUTTI (REBELS, STAR WARS, BATMAN ETERNAL, PROMETHEUS). Everyone thought the Port of Earth was going to be beneficial to humanity. But with the amount of incidents and loss of life that have occurred since it opened, public opinion is low on whether or not the Port should remain open at all. The Earth Security Agency, the ESA, was created to maintain peace between humanity and alien visitors who stray too far from the Port of Earth. Agent George Rice has just lost his girlfriend to a rogue alien and there is no time to mourn. On his way to turn in his badge and speak to the psych department, the ESA headquarters is attacked and put on lockdown. Agent Rice is more concerned with turning in his badge than he is with his girlfriend who just died. I think this is a great way to depict shock and PTSD. As the battle ensues at ESA headquarters, Rice and McIntyre discover a shocking secret about the port. With no time to discuss it, the Agents track their alien target to an unlikely battlefield: the Port of Earth. No human has ever stepped foot on the Port of Earth itself. Until now. I love what we see of the Port. There are over a thousand miniature habitats inside of it that are designed for the many different alien visitors who may visit the Port of Earth. It reminds me a lot of the City of a Thousand Planets from Valerian. You’re in a swamp one second but the moment you go through a door you’re in a desert. The relationship between our two main ESA Agents is also expanded here. Agent Rice, the once calm and collected of the two, has completely snapped and is out to avenge his fiance. Agent McIntyre on the other hand, who joined the ESA just to kill aliens, is the voice of reason trying to convince Rice to turn around. They were always polar opposites, but here the two have completely flipped personalities and it’s working out really well. One of my favorite little things about Port of Earth is how each issue is framed around a TV interview that delves into the socioeconomic issues surrounding the Port and its effect on humanity. This volume spends more time on this as we finally raise the question: who is the Consortium? I have a feeling we’re about to find out. The plot to Port of Earth is always moving forward as the mystery unfolds. The entire storyline has taken place on one day so far with no time for our characters to take a break. Port of Earth has been doing a great job with creating a science fiction story set in a future that seems all too topical in today’s political climate with regards to immigration, the energy crisis, and militarization. It’s been great having our two main characters each represent a different side of the political spectrum. Rice is here to protect the earth, McIntyre just wants to kill aliens no matter what. It’s imaginative and original and features a masterclass on writing dynamic, three-dimensional characters. I love learning about this world every month and I hope this journey never ends. Click here to order your copy of Port of Earth Vol. 2 and click here to get caught up with the first one.